Mandarin is a language that since the beginning, has always made sense to me. The perfectly logical sentence structures and grammar are like building with blocks, and the tones add a layer of complexity that keeps it interesting. Thanks to this combination, it’s a language I’ve had I love affair with for the past decade. However it’s also language I’ve never been able to reach fluency with, always leaving China or Taiwan when I was on the cusp. Then I find when I’m back in Taiwan, China, or am face to face with Mandarin speakers, I’ll have forgotten the basics and will feel frustrated. This time I want to learn it for real, but that will mean reviewing and repeating things that I’ve forgotten over the years. Why did I Choose to Learn Mandarin? It was the first day of my sophomore year in college when I stumbled into the classroom, bleary-eyed from the early hour and ready to learn how to ask my classmates to let me borrow their pencil in Mandarin. I initially decided to learn Mandarin for business purposes. It’s so widely spoken and China is an economic powerhouse. I wanted in on the action. However over the years I have come to really fall in love with the way the language flows, and I’d be lying if I said it’s not really fun seeing native speakers’ reactions when I speak Mandarin to them. However this language has meant a lot more to me than a fun party trick. Beginning to learn Mandarin when I was 19 set the tone for the adventurous journey I’m on today. This language led me to apply for a Mandarin scholarship in Taiwan when I was 21 as a way of delaying adulthood. This experience showed me other cultures and ways of life, which I yearned for in my corporate years and eventually went back to in 2012. Ever since, I’ve practiced it while hitchhiking through China, saying a few words when I encountered Chinese tourists abroad, and even using it at convenience stores in Tonga and directing a group of Chinese speakers to a workshop at my camp at Burning Man this August, of all places. 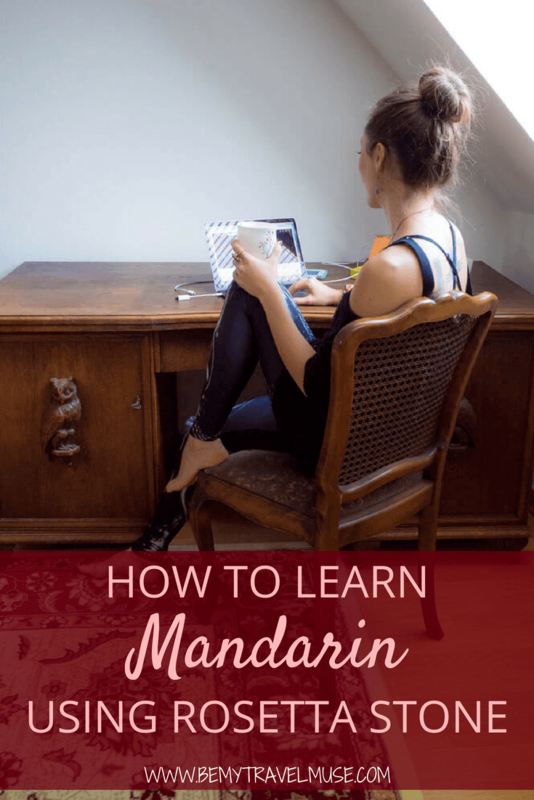 The way to learn a language is by practicing, and without having Mandarin speakers around me, I decided to try learning online. I tried a few online programs and was frustrated when I couldn’t use them offline or didn’t jibe with the workbooks. Then I looked toward Rosetta Stone. My mom has been using Rosetta Stone for years to learn German, and then Spanish. Her enthusiasm for the program, and hearing her practice with her language instructor when I’m visiting, encouraged me to give it a try. The language course that allows me to study on my own time and also to talk to a native speaker when I want to? It sounded perfect for a busy traveler. Rosetta Stone is a language learning program that’s available online through monthly or yearly subscription (it’s on sale now for $6.49/month for 24 months), via CD, or via download. Unlike the classrooms I learned in, Rosetta Stone uses no English, instead teaching you language through context, which is the way that I picked it up when out and about in Taiwan, and of course, the way that I learned English as a baby. This immersion technique is what Rosetta Stone is famous for. The course works by showing you a series of pictures and audio. As you go through the course, you memorize by repetition through clicking on corresponding sentences and images, repeating and reading out audio while looking at an image, practicing pronunciation, and grammar exercises. There are also written practice components to every lesson. Each of these methods are presented in different combinations and ways to let the language settle in and keep learning interesting, more like a game than a class. As an online student you can also purchase live tutoring with a native speaker, which is a great opportunity to put it into practice and have your pronunciation corrected. It’s quite a different approach to what I ever did in the classroom, where we began with English and then translated it into Chinese. I find RS’ method encourages me to translate in my head less. I remember when I was taking classes in Taiwan I disliked the structure. Certain aspects of the way we learned, like listening to tapes in silence or making presentations about our hometowns, just didn’t work as well for me, and so I wanted to be able to opt out of doing them all together. However we were studying to earn grades and a good grade was necessary to move on to the next level, so even though I had already graduated from college, I was still a student who needed to perform. That encouraged cramming which as all former students know, is not the best way to retain information. The benefit of not being in a classroom to learn is that with something like Rosetta Stone it’s up to you how you want to learn. Of course, that means that you have to be dedicated and encouraged enough to keep yourself on track, but that’s true of language learning anyways. It can be a necessity, but it’s also a passion project. 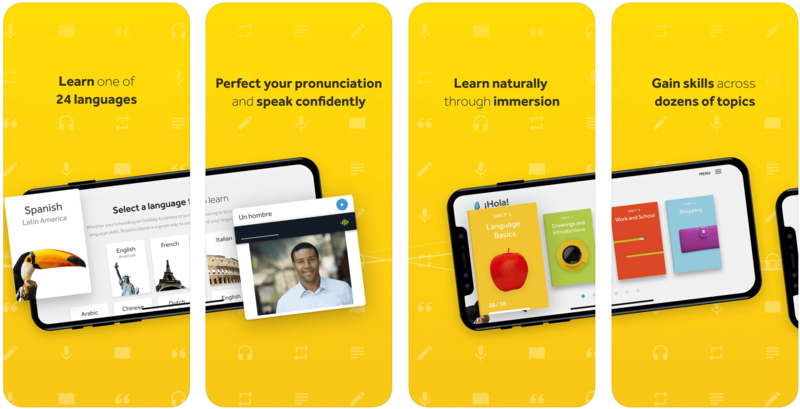 What I also appreciate about Rosetta Stone, unlike some of the other programs I have tried, is that I can download lessons to do off-line, and I can use it both on my phone and my computer. 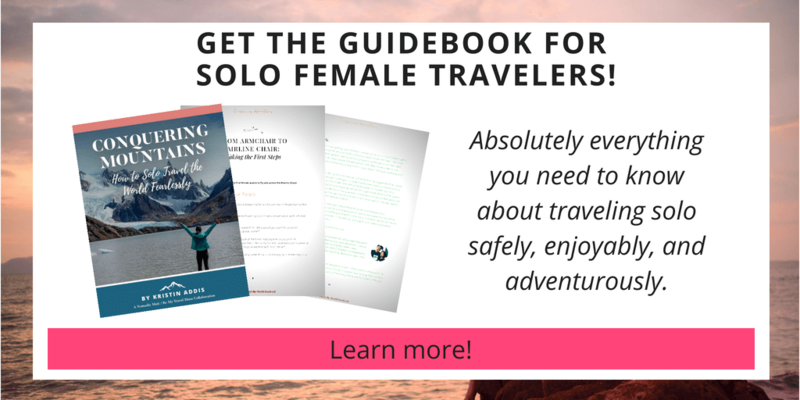 This comes in pretty handy when in transit, because goodness knows we travelers have a lot of downtime on trains, planes, and buses, right? Sound good? You can sign up here (affiliate link). Can you reach fluency with Rosetta Stone? A study found that 70 hours of study using RS was equivalent to a semester of studying Spanish (though a semester in high school vs. college vs. a language school are vastly different, so in short, it’s hard to measure). Rosetta Stone provides a foundation for getting good at a language, however the only way, in my opinion, that you can get fluent is to surround yourself with speakers and/or to go to the country and commit to learning. I found that living in Taiwan, I preferred to ditch the listening labs in school and go out and sit in cafés and listen to people, to have language learning partners, and to live in the environment. 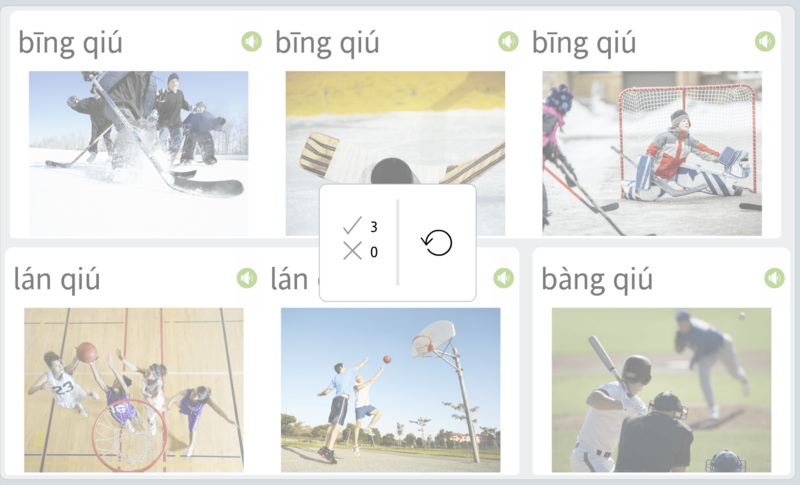 What I like about Rosetta Stone is it gives me the confidence I need to put myself back into a Mandarin speaking country so that I can hit the ground running. I believe it can establish the foundation for fluency in a way that methods I tried, like Duolingo (which wanted me to translate sentences into English, which I didn’t see the point of) and the classroom, fell short. As anyone who has attempted Mandarin knows, it’s a lot different learning a language with characters than an alphabet. The nice thing about Rosetta Stone is all of the different approaches to learning, including audio, visual, and spoken. Rosetta Stone is a great supplement for those who already know some of the language and want to review, and also for those who are beginners and want to lay the foundation. I also personally quite enjoy being able to take classes in my undies or onesie. I had the confidence to speak a bit more this summer after using Rosetta Stone. It helped me to remember the basic words I sometimes forget which make me otherwise shy away from speaking. I love this program for the ease of use and accessibility. For reviewing and building a foundation of learning a language, I think this is a great method. If you’d like to learn more and take advantage of the program sale going on now, click here. *This post was brought to you in partnership with Rosetta Stone, however I only provide positive reviews of programs I use and love. Your trust always comes first. This post also has affiliate links. if you make a purchase through the link you support this blog at no extra cost to you. This is an incredibly interesting approach to learning a language!